I met my hair stylist at a reading from author Michale Ondaatje at the Seattle public library. Sarah and her then partner stood in line behind me to get our books signed. I was there by myself — newly single, almost moved out from living with my ex, I'd recently started a new job — and Sarah had just begun extra training and was an intern at a hip Seattle salon. My long, blonde hair was raggedy and desperately needed a haircut. Sarah needed clients to pass her internship. She likes to joke that they thought I was cute and chatted me up. Yes, I picked my hair stylist because of her taste in literature. I'd never liked any of the haircuts I'd had over the previous years. Every length and every shape. (<— Seriously, click that link if you want a laugh at my expense.) Sarah made it her mission to make me happy with my hair. I'm her client zero. Yes, she did jet from intern to stylist. Not that I was surprised. Turns out when you pick your stylist this way, you have other things in common. Turns out, talking about redheaded lesbian superheroes is way better than discussing your job or the weather. Over the years, Sarah became an actual friend who comes to my parties and vice versa. She was one of the first people to know I'd started dating Jacob, and I'm up-to-date on her musical-themed dating life. We've both seen each other grown in our careers, our confidence, and frankly, how much we're worth. Last Wednesday, I got my haircut. Sarah gave me the official news that she was leaving that fancy salon, and Friday was her last day. Per her contract — and because this is how companies work — she had to "break up" with her clients and recommend another stylist there. Sarah said she'd gotten really good at The Talk, whether other clients gave tears or shrugs. Obviously, Sarah's not getting rid of me that easily; but it's still the end of an era. 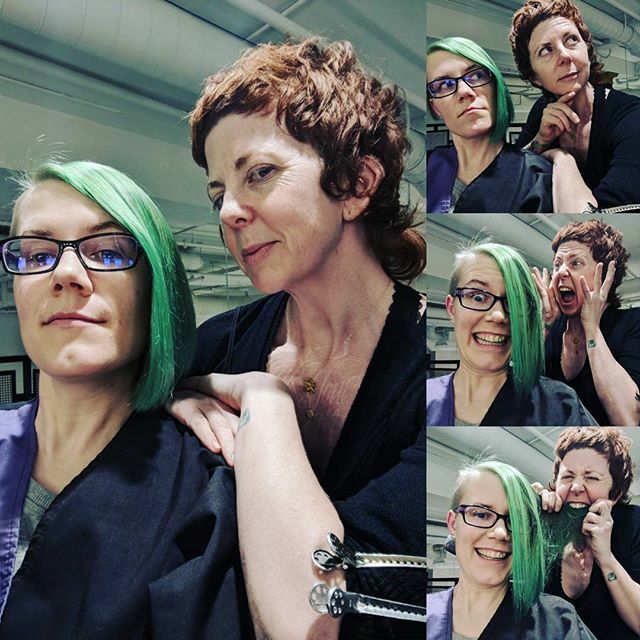 My freshly greened hair minted with Aveda products that my cat Hermione's determined to clean off. Being in a ridiculously fancy salon with lights and lots of chatter and drinking lukewarm herbal tea. Sarah showing off her wrists, stained in whatever color my hair ended up being. But we'll have new shampoo bowls to drench in unnatural colors. And we'll see if I have to bring my own tea or not. In the meantime, we may even have another session in her kitchen, which hopefully ruins less of my clothing. In terms of writing, this story is all over the place. (Issue #6 is a straight up backdoor pilot for Detective Comics that has nothing to do with the rest of the story.) The art is beautiful and wonderful as it's Steve Epting (regular artist) and Stephanie Hans (flashback issue). This is an incredibly strong addition to the Black Panther mythos and the world Coates is building for T'Challa and company. Finally finished up this first run of Bombshells. The story ends more quickly than I anticipated, but overall, a solid and fitting closure. Book number four in my #52Challenge: a mystery novel. I couldn't put this down and read it mostly over two days. Full review coming soon. This continues to be such a great, solid series about the friendship of three women in college. Some excellent dealing with toxic relationships and housing in this trade. Book number three in my #52Challenge: a novel considered a classic. Of course, it took me more than a week to read. Orlando's weird and funny with lots of satire about writers. More than I was expecting, given the commentary on gender and society is the forefront issue. It's odd to see others saying how different it is from Woolf's other novels; the challenging parts for me to get a grip on reminded me of my greater struggle with To the Lighthouse. I will have a full review coming soon. As a tea loving, queer lady, this middle reader comic hit my sweet spots. I want a tea dragon. Highly recommended for those with kids. Finally publicly posted my review of The Price of Salt, and my many thoughts on lesbian romance and how — possibly sadly — relevant this book remains. We're all a little Theresa and a little Carol. [STAR TREK DISCO] Called it! Both major spoilers. I haven't written anything about new Star Trek here, or really anywhere except in conversations with Julia and Matt on IM. Oh, also Jacob loves when I wake him up late Sunday nights to tell him my all feelings on Star Trek.